Get an immersive viewing experience in Full HD1080p with images so realistic you feel like you are part of the action. Loaded for all-out performance with a Quad Core Intel Core i7 processor, dedicated NVIDIA GeForce graphics, and plenty of RAM. 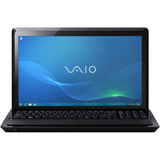 The VAIO F series laptop was built with the multimedia enthusiast in mind. With a large screen for game playing and movie watching, a seamless speaker bar with mind-blowing sound, and a preprogrammed Function F1 key that allows you to turn off the touch pad while gaming, the Sony engineers considered every detail. You even get a backlit keyboard so you can play and work with the lights turned down.